This breed, also referred to as the "king of all Terriers" is the sturdiest, largest and most versatile Terrier. The Airedale has a varied history as a "jack of all trades" being a rat chaser, otter and bird hunter, rescue and police and war dog. It is said there isn't anything that an Airedale Terrier cannot do! It's no wonder that a pet whose top qualities read "clever, friendly, proud and courageous" would be a favorite of John Wayne, who owned his own Airedale named Little Duke. This is an excellent choice for a multi pet household as well as families with children. This is also a fair choice for those that desire some watchdog ability. They are playful and do best if allowed to participate in all family activities; they should not be left alone or in small, confined areas for long periods of time. They need moderate exercise and are considered high maintenance in regards to grooming. Most owners would agree that members of this breed are highly trainable and pick up on tasks during the first attempts. Generally healthy dogs, the Airedale should live 10-13 years. The Airedale Terrier is a member of the Terrier group of breeds, and was originally developed to be a working and hunting dog; these versatile, confident animals make great companions for families of any size, and are good on their own or with other pets. This is a medium sized breed with a sturdy appearance. They are the largest of all Terriers with males standing 23 inches at the shoulder and weighing in at 55 pounds; females are slightly smaller. Overall, members of this breed are considered courageous, friendly, playful, trainable and yet fairly calm. A properly trained and socialized Airedale can be the perfect choice for families with children or owners with other pets. Children should be supervised if not of age to be taught how to appropriately and gently handle a pet. This breed is friendly, playful and typically non aggressive and therefore make good companions for other dogs as well. Airedales will likely be friendly towards strangers but will alert owners to anything they consider necessary. Airedale terriers are moderate maintenance dogs. Grooming requirements are high, training requirements are fairly low and exercise requirements are somewhere in between. These guys need to be brushed a few times per week in order to ensure minimal shedding and a coat that is in top shape. It is also important to note they will need clipping at least 3-4 times per year; most owners chose to get this done by a professional which can be costly. Airedales need moderate exercise that can be met with a couple daily walks or outdoor playtime in a fenced area. They are very playful and enjoy an activity the owner will participate in with them from frisbee to hunting. Finally, Airedales are very trainable and willing to please; they are also very clever and will not be interested long if asked to do repetitive tasks. The Airedale has a varied work history and is a favorite of many prominent people including actor John Wayne, writer John Steinbeck, and presidents Wilson, Harding and Coolidge. This breed is now thought to be a mix of the Black and Tan Terrier (now extinct), Otterhound, and the English Bull Terrier. The Airedale Terrier came about during the mid-1800s when ratting was considered sport in the English countryside. Along the banks of the Aire River these dogs would chase rats, that had been specifically expelled out of their holes to the delight of crowds, into the river. In 1879 after the breed already had a following of fanciers, it was dubbed the "Airedale Terrier", although originally call the Working Terrier or Waterside Terrier. Airedales were first recognized by the Kennel Club of England in 1886. 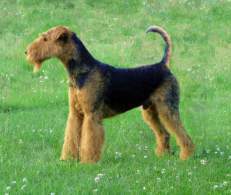 They are recognized by numerous additional kennel clubs including the AKC, which officially accepted the Airedale in 1888. The Airedale Terrier Club of America is the parent club and official spokesman for the breed in the United States. As World War I was beginning, this breed was a popular war dog due to their courageous and confident personalities. They delivered messages from commanders to the troops located in dangerous trenches; they could often be seen on the battlefield alerting English soldiers to approaching enemies and even wearing gas masks. Members of this breed were also utilized as rescue dogs by the Red Cross, police dogs, and large game hunters on African expeditions. Although their population declined after war times they are still well within the top 100 dog breeds in America. 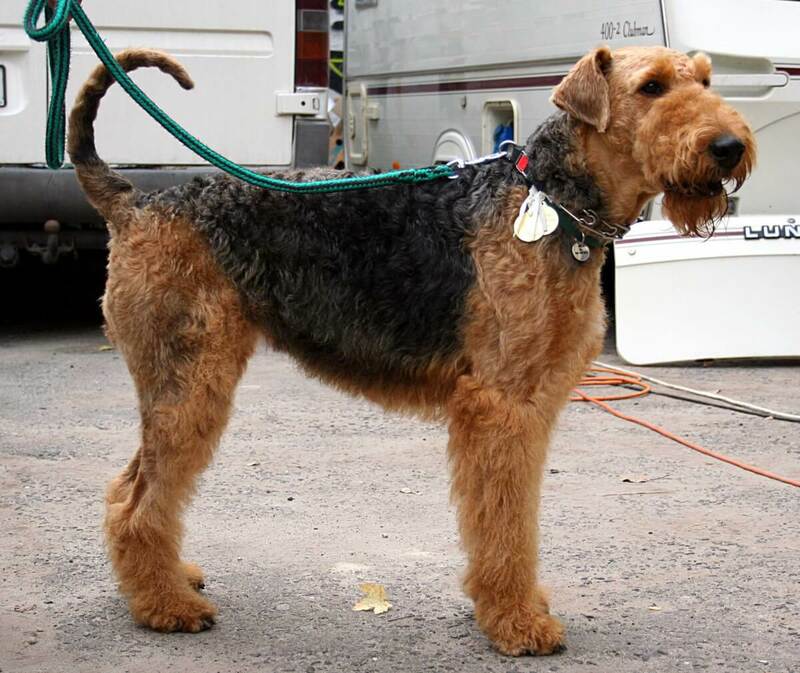 Airedale Terriers appear square, sturdy boned and are the largest of all Terriers. The black and tan coat of this breed is thick and wiry (sometimes slightly wavy), closely covering the body and lying atop the short, softer undercoat. 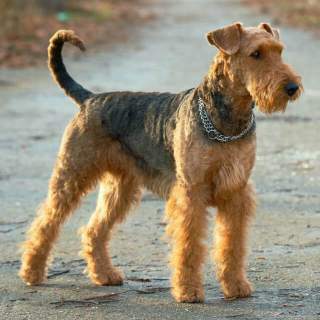 Airedale Terriers have a notably long and narrow face with flat, unpronounced cheekbones; they also possess a characteristic full beard and moustache. Their ears are small, v-shaped folded neatly and set towards the upper side of the skull; the eyes are round and expressive of the cleverness that makes them unique. The neck is moderately long and widens as it reaches the shoulders which in turn slope transitionally into the back. Their deep chests reach their elbows, however, this bodies are not wide. Forelegs of this breed are very straight while hindlegs display well-muscled thighs and well bent stifle (knee) joint. They have a tail that is of some length and carried high but never curled over the back; in true Terrier fashion they stand erect and alert. This breed is typically either black and tan or grizzle and tan. 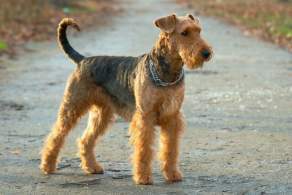 The Airedale Terrier doesn't have a lot of variation within the breed, at least in terms of specific physical features like ear size or tail length. 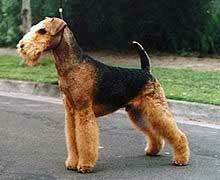 Coats of individual Airedales are pretty consistent as well: wiry, thick, and double-layered is the norm. 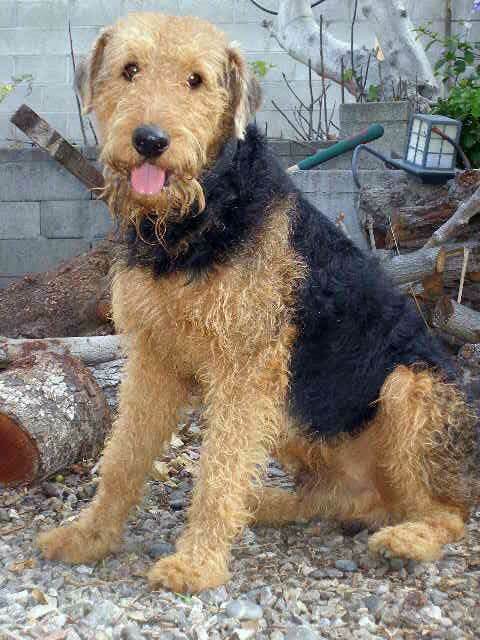 King Oorang Airedale Terrier: Named for Oorang Dog Kennels, an Ohio kennel that developed this bloodline in the 1920s, these Airedales are much larger than the typical size, reaching 120 pounds in weight and 28 inches in height. 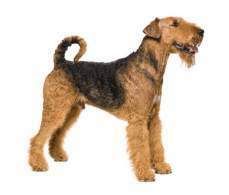 Miniature Airedale Terrier: This variety is obviously smaller, weighing as few as 20 pounds. 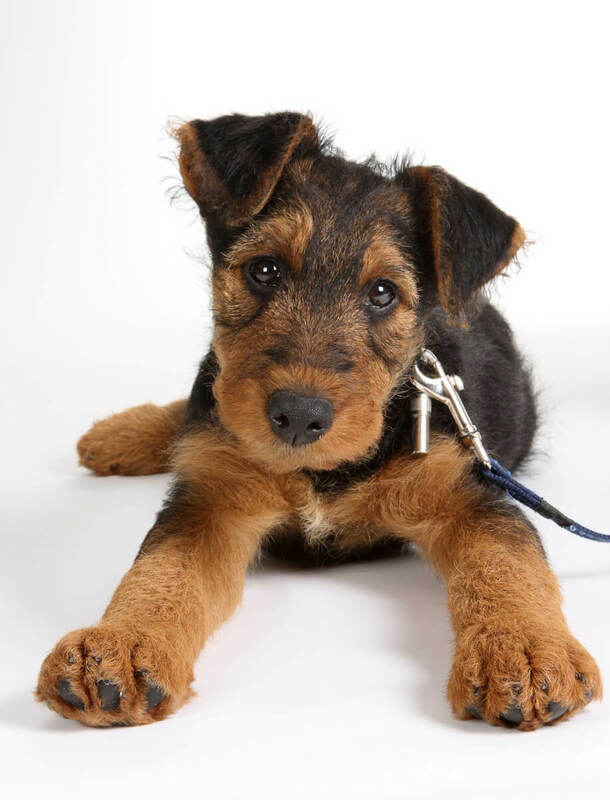 Debate has long ensued over whether the Mini Airedale is a true breed variation, or simply another breed entirely--the Welsh Terrier. The two breeds are nearly identical in appearance, so the only way to know an individual dog's true genetics is through DNA tests. The breed is devoted and courageous, confident and proud, clever--yet with all the qualities that could make a dog stubborn and headstrong, the Airedale remains calm and willing to please. They are friendly and playful, making a great addition to a family with pets and children. They are not aggressive towards strangers unless presented with a serious threat but they make good watchdogs; they are not noisy barking dogs unless they need to alert their owners to something. Members of this breed are clever and known for being highly trainable. This is most often true with an owner that can offer positive reinforcement and calm, positive energy. It is not uncommon for an Airedale to pick up on a trick or command within a few attempts and does not need constant refreshing after these things become learned. However, if they are subjected to a trainer or owner that was asks them to do the same action repetitively they may get bored. At the end of the day an Airedale is, after all, a Terrier and can be prone to digging, investigating trashcans and other places you don't want them to, carrying off items left lying around, and even chasing animals that resemble rodents. These friendly dogs do very well with families, in fact, owners agree that they are the perfect family pet. A properly trained Airedale enjoys playing with children and will be ready to participate in any activity their owner is performing. Small children should be instructed how to gently and appropriately interact with the pet and should always be supervised if they are too young to be taught these techniques. It is important to note that all puppies should be trained and socialized to maximize the likelihood of being a fitting family companion. Airedale owners agree that this is an excellent choice for multi pet households. The Airedale gets along very well with other dogs and pets. They are usually not the aggressor but will also stand their ground if challenged. Rodent like animals should be kept in their proper living spaces around this dog due to their history as rat chasers. Puppies should be trained and socialized at a young age to develop appropriate social skills. Around strangers the Airedale appears proud yet friendly. They have history not only as police dogs but also wardogs braving the battlefields and trenches to alert their soldiers to the enemy; this makes them good choices for a watchdog, as they will alert their owner/family to anything they deem necessary. This breed has the confidence to not be aggressive in personality and still be able to protect themselves when needed. 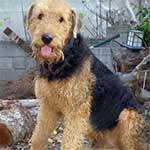 Below are pictures of the Airedale Terrier dog breed. Airedale terriers are moderate maintenance dogs. Grooming requirements are high, training requirements are fairly low and exercise requirements are somewhere in between. These guys need to be brushed a few times per week in order to ensure minimal shedding and a coat that is in top shape. It is also important to note they will need clipping at least 3-4 times per year; most owners chose to get this done by a professional which can be costly. Airedales need moderate exercise that can be met with a couple daily walks or outdoor playtime in a fenced area. They are very playful and enjoy an activity the owner will participate in with them from frisbee to hunting. Finally, Airedales are very trainable and willing to please; they are also very clever and will not be interested long if asked to do repetitive tasks. The owner/trainer will encounter the smoothest progress when they have positive energy and enforcement and remain calm; having variable training routines can help too such as combining obedience, agility, and tricks within the same lesson. 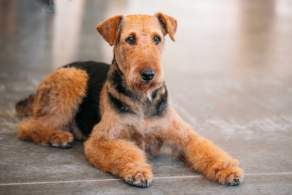 The medium-long coat of the Airedale needs several weekly brushings to keep it in good shape, free of mats and tangles. As with most breeds regular ear and teeth cleaning is expected as well as nail trimming. Many owners prefer to let their Airedale Terriers be groomed by professionals since clipping or hand stripping of the coat is recommended 3 to 4 times per year. If groomed regularly shedding can be reduced; they are not considered a hypoallergenic breed but this will greatly reduce dander for those with allergies. Aire-rescue.org gives many excellent in-depth suggestions about equipment and techniques to groom your Airedale. Although they are considered medium energy, members of this breed are clever and playful so they need both mind and body exercise. A couple daily walks should help meet this requirement. Members of this breed also enjoy outdoor games such as flyball, frisbee, agility training, hunting, and searching activities. Training is also a great way to exercise your pet and Airedales are known for being highly trainable. If not given adequate daily exercise this breed will be bored and not as pleasant to have in your home. This is a very versatile breed that can spend time indoors or out, however, this dog must be around the owner or family and does not enjoy being left alone for long periods of time, especially in confined spaces. They make good indoor dogs as long as they are given daily physical and mental exercise; the breed has extensive history as a working dog is not averse to spending much of time outdoors, however, they prefer to sleep indoors with their owners if possible. Airedales are tolerant towards heat and cold but it is important to not leave your pet outside during extreme temperatures. They can spend ample time outside but prefer to sleep indoor with their owners. 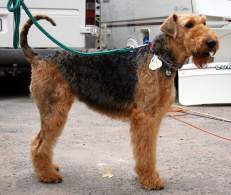 The Airedale is the largest of all terrier breeds. These dogs are called the "King of Terriers" for good reason: males can be as large as 25 inches in height and 70 pounds in weight. Though originally developed to hunt vermin, Airedales are also capable of hunting much larger game. One Airedale Terrier won a prestigious British war medal. Jack the Airedale died after completing a dangerous mission during World War I. When one British battalion was pinned by German forces, the troops dispatched Airedale Jack to deliver a message to the rear echelon to send reinforcements. And despite being fatally injured, Jack was able to deliver the message and save the battalion. Jack died soon afterward--but the dog posthumously received the Victoria Cross, Britain's highest military honor. Many owners have their Airedales hand-stripped several times per year. Hand-stripping, a process involving "plucking" individual dead hairs of the coats of wire-haired dogs, leaves the coats looking much cleaner and healthier. The procedure can take a while, so a lot of people have a professional groomer do it--but owners can certainly learn to strip their Airedales themselves with a bit of practice. Hip dysplasia, gastric torsion and diseases of the colon are the most frequently seen issues for Airedales. Most of this breed live 10-13 years on average.